Philippine Taxis are available at the international and domestic airport and at major hotels with fixed rate depending on your destination, you can proceed to the various taxi stand at the Ninoy Aquino International Airport and request the hotel reception for your taxi requirements, or you can call a taxi yourself on the street, which is cheaper. Just make sure that the driver turns on the meter. If he gives you a story that it is broken, get out and take another taxi. Air-conditioned taxis cost PhP30.00 on the meter and an additional PhP 2.50 is added for every succeeding 200 meters to the final cost. Unless you are taking a long trip or the traffic is unusually horrible, most taxi rides should be well under P100. Long trips would cost depending on the meter. 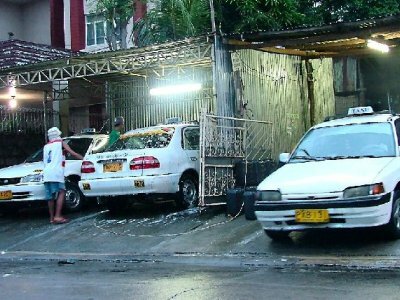 At nights, taxis in the Philippines are gone, only few of them can be. Since it is unholy hour and not rush hour, taxis at nights are very seldom. You may wait untill there is am empty-seat taxi would come. At nights especially, 12 midnight, taxis at night in the Philippines sometimes does not use the meter anymore since it is unholy hour. You can just negotiate how much is the fare depending how far the destination is.